This is a guest post by Elizabeth Fleming, the Florida Representative for Defenders of Wildlife. On a recent moonlit evening, Shannon Miller, Florida Program Coordinator, and I were fortunate to be able to accompany professor emeritus Dr. Llewellyn Ehrhart and several graduate students from the University of Central Florida (UCF) to observe sea turtles nesting on Archie Carr National Wildlife Refuge (NWR). Dr. Ehrhart and his team have conducted annual nest monitoring studies in the refuge between Melbourne Beach and Sebastian Inlet on Florida’s east coast for more than 30 years. 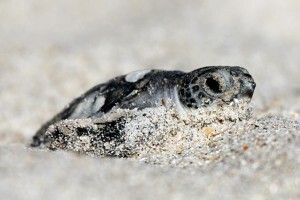 Archie Carr NWR and the sea turtles nesting on that stretch of beach are an example of one of the most successful conservation efforts in Florida. The refuge was established in 1991 to protect nesting habitat for sea turtles. The state of Florida supports 90% of all sea turtle nesting in the continental United States and the refuge is home to the largest nesting aggregation of threatened loggerhead turtles in the western hemisphere. This same area also supports the highest density of endangered green sea turtles in North America, and an increasingly important nesting area for endangered leatherbacks. State, county and federal officials and private entities began piecing together this 20.5-mile patchwork of coastal properties in the late 1980s. And while the refuge exists in and among development, beachfront property owners in the area embrace sea turtle conservation efforts, including keeping lighting to a minimum on the beach so as not to deter nesting females and disorient hatchlings. Florida is positioned to break a record this season for green sea turtle nesting. 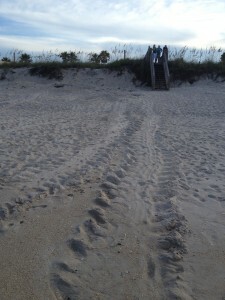 As of today, UCF researchers have confirmed 10,420 green turtle nests on the refuge. That means that this year’s nesting has already greatly exceeded the last record number of 5,505 nests in 2011. And since nesting will continue for some time into September, those numbers will likely grow. During our trip, Dr. Ehrhart recalled that when he started monitoring nests on the refuge, documenting a total of 50 green turtle nests for the entire season was the norm. Over the years, this represents an annual increase of 13%, and shows that the Endangered Species Act (ESA) has helped to protect and recover sea turtle populations in Florida. Green sea turtles were nearly wiped out from the region when Europeans began exploring the Americas and sea turtles were overharvested for their meat and eggs throughout the Caribbean and in Florida. By the time the species was listed in the 1970s, populations had plummeted. It’s wonderful to see such a great improvement today, and to get a firsthand look at the success at Archie Carr in particular. On the night we went out, the beach was dark, the stars and moon were out and a wonderful sea breeze kept insects away. From about 9:30 pm until 2:00 am, we were able to observe several female loggerheads and much larger green turtles on the beach. We watched turtles emerge from the ocean and climb up the beach, lay their full clutches of eggs, cover their nests and then crawl back to the ocean. Once a female arrives to a suitable spot at the base of a dune, she spends about an hour digging the nest and depositing eggs into the deep chamber. With a filtered red light aimed into the nest, researchers allowed us a view of the eggs being deposited. Turtles lay on average well over 100 eggs (about 111 for loggerheads and 130 for green turtles). Once a turtle finished laying, she covered up the eggs by packing sand over them with her rear flippers and flinging more sand over the nest with her front flippers. When the nesting female was finished, the researchers took measurements and biological samples, checked for flipper tags and scanned for microchips. If they didn’t find these identifying features, the students added them. Tools like these help researchers keep track of the individual turtles’ movements, providing important information about migrations, nesting locations and other behavior that can be vital to protecting these endangered animals. Not all the hatchlings made it to the water without help. Some had become trapped in their nests the night before, and then rescued by the researchers. At the end of the night, we helped release several of these loggerhead and leatherback hatchlings a few feet from the water’s edge. When only an estimated one out of 1,000 hatchlings survive to adulthood, we have to give the next generations of these endangered species as much of a fighting chance as possible. It was incredibly inspiring to see these fascinating, ancient animals, on a dark beach in a modern world, continuing a ritual that they have practiced for millions of years. This post was originally published at Defendersblog.org, the blog of Defenders of Wildlife, an Endangered Species Coalition member organization. I found this article most compelling. I have done extensive research on the history of turtles and turtling in South Florida and would like an opportunity to speak about it to other turtle enthusiasts.